First, let me say "Thanks for looking". Building a blog is something I have wanted to do for a long time and finally I have the chance. I will be writing here from time to time and I hope you enjoy following along. I arrived in Amsterdam’s Schiphol Airport and went to meet my daughter. She wasn’t where I expected her to be. Now I understood the virtues of a light camera bag. But I still didn’t know how the Fuji would perform. I had done some shooting with it before I left home but nothing major. I searched for her and finally we found each other. After listening to a pitch to take a Porsche at the car rental agency, we left on the Volvo we originally reserved. We set off for Maastricht, Holland. We arrived at a beautiful church that had been converted into a hotel. It was beautiful, especially with all the Christmas decorations. The rooms were very modern and unique. We went to the local Christmas market and I shot some street scenes. The camera, even with the large 12mm Zeiss lens mounted, was unobtrusive. No one noticed me taking pictures. Certainly, if I had pulled out the D4 they would have taken notice. Score a point for the Fuji over the D4. The next morning we pulled out for the National War Museum in Luxembourg. It was raining but the temperature was around 45 degrees. We travelled through Holland and Belgium. On the way we drove through Bastogne. Of course, we stopped at the 101st Airborne Museum there. After a short drive around town, we continued on our journey. It helped that the Volvo had a good GPS system. The National War Museum was a short drive away and contained numerous dioramas and displays. After a pleasant visit, we asked how to get to the touring trails of the Battle of the Bulge battlefield. After seeing all the wonderful displays we were ready to see the actual battlefield. We set off, with the continuing rain, to find the touring trails. Before leaving home, I found an annotated map explaining what went on at each stop on the trail and I found out that the German trail was about 18 km long and the American trail 5 km long. We searched and searched and finally found a way into the American trail. But there was a sign we did not recognize. We had no Internet connection and no idea what it meant. We pressed on and entered the trail. It was narrow but passable. We saw two people walking and they told us the trail was muddy ahead and that we did not have the right tires on the car. We left the trail and drove around the area in the rain before leaving for Heidelberg, our next stop. It wasn’t until we got to Stuttgart that we learned that the sign meant no vehicular traffic. It was a walking trail. The drive to Heidelberg was longer than I expected. But driving the autobahn was a pleasure. Heidelberg is a nice city on a beautiful river. There were not many people around because I was there on Christmas Day and the day after. I did not take many pictures here or in Belgium/Luxembourg due to the rain. The Fuji is not waterproof like the D4. Score a point for the D4. In Stuttgart, I began shooting in earnest. My first stop was the Porsche museum. Beautiful facility. It was indoors so I could shoot with abandon. I quickly noticed how nice the colors were with the Fuji. The sensor is very nice. Color tones are accurate and clean. I shot in both RAR (Fuji’s version of RAW) and JPGs. The JPGs allowed me to see what the shot would look like if printed on Fuji’s Velvia paper. I did not even notice that I was shooting with an APC size sensor. I liked that the camera was mirror less and noticed it mainly by how quiet the camera was when the shutter was fired. I can certainly see why the future is with mirror less cameras. I really want to see what the Nikon mirror less camera equivalent to the D4 is going to be like. Shooting in the Mercedes museum was similar. The Fuji handled the different lighting levels with no issues. The sensor did not show much grain at high ISOs. I had been spoiled by the D4’s great low light capabilities and dreaded how noisy the Fuji would probably be. But the Fuji did not let me down. Noise was negligible. I took many, many shots. Of course my editor will mainly be interested in the shots at the Porsche museum. 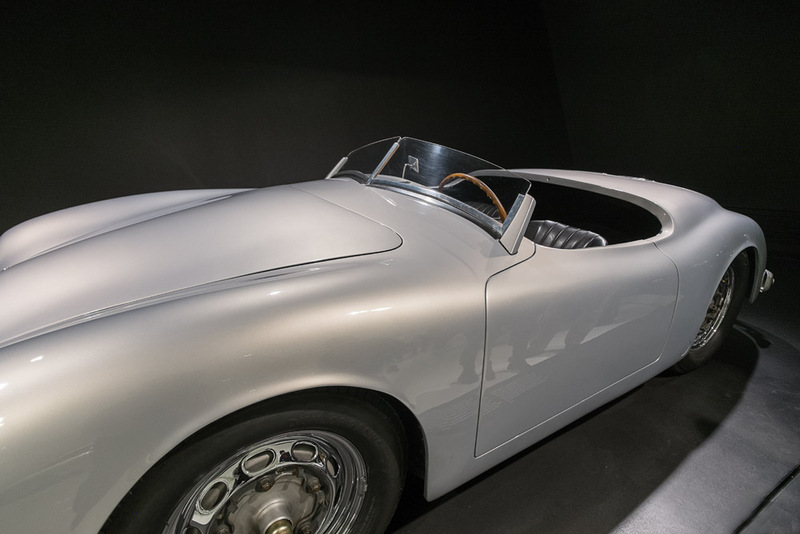 In neither the Porsche nor Mercedes museums did I need the compact Fuji EF-X20 fill flash. This flash has low power but is perfect as a fill flash. Beyond that, the flash has too little power to be of much use. All in all, it was a successful trip. The Fuji did exactly what I wanted it to do and I wasn’t disappointed about not bring the Nikons. The Fuji has earned a place in my bag.